Where space is limited, most apples and some pear varieties (follow this link if you are interested in buying quality fruit trees) are suitable to be trained as cordons. 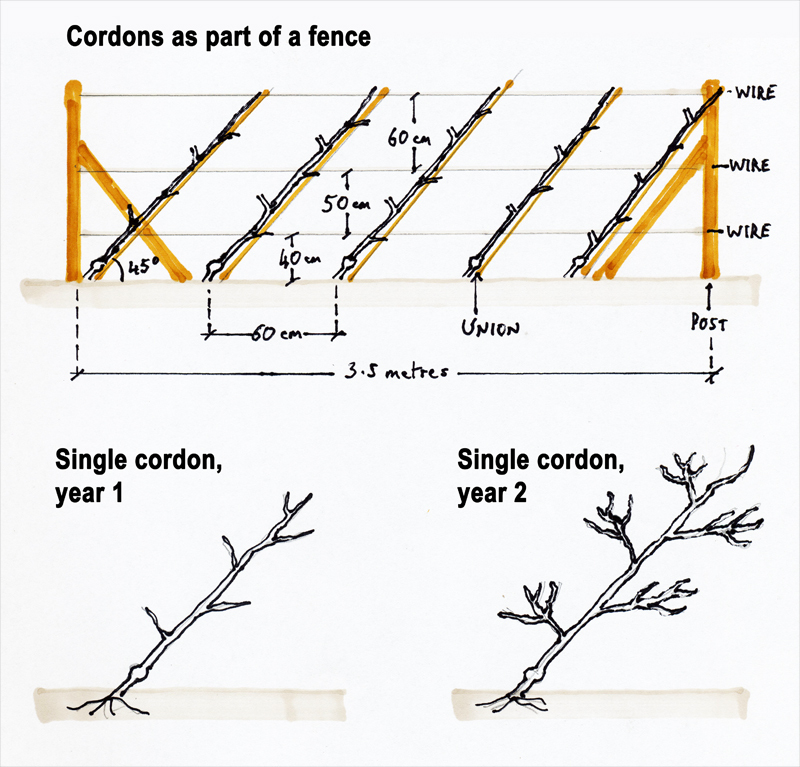 A cordon is a tree planted at an angle of 45 degrees, supported and trained along a fence or a wall. Along the wall or fence, horizontal wires are positioned at a height of two, four and six feet. A six-foot bamboo cane is fastened to the wires at a 45-degree angle, at two-foot intervals. These trees are based on the maintenance and supply of short laterals along the main stem of the tree. The first laterals should be in place at approximately 40 cm above soil level. It is essential that the union of the tree is 1.5 to 2 inches above the soil level. For very deep and fertile soils, the M9 rootstock is suitable. However for most situations, M26 is the best rootstock for a cordon tree. On very hungry soils, it might be possible to use the stronger stock MM106 to good effect. Plant the trees 60 cm apart after having made very sure the soil does not lay wet during the winter or summer months. If drainage is faulty, the trees will suffer badly from tree canker. As a result, the life of the tree is short and the fruit will have a short shelf life. It is also essential that the soil is well prepared in advance, during September and October, while the soil is still warm and friable. Dig over, for each tree, an area of at least 60 x 60 cm. Before you add the essential organic matter such as well rotted farmyard manure to the soil, make sure that the subsoil is well loosened with a rigid tine fork, so that water can always drain away quickly. Tree roots need lots of oxygen and where water is standing around the roots, oxygen is not available. The trees literally suffocate, if this is not corrected! Summer pruning is essential to ensure that the tree stays within the limited space available. Pruning must not be carried out during the late autumn or winter months. The cordon tree performs best when pruned during the summer months. The first pruning should be performed by the middle of July in the south of England. For the middle and north of England, start pruning seven to ten days later. Cut all the newly-formed shoots back to five leaves lengths. One newly-formed shoot per growth point is enough. When doubles occur, bring them back to single shoots. By the middle of September, cut the same shoots back to three-leaf lengths. As sub-laterals are formed in later years, cut these back to one leaf lengths. The aim is to create strong fruit buds on two to three-year old wood, as well as spurs. These well-budded-up lengths of wood can be up to nine inches long. Leave these lengths of wood intact as fruit buds will have formed along these two-year old shoots. Some varieties will produce fruit on one-year old wood. All the same, in order not to exhaust the trees, it is best to halve these shoots by the first week of June. Thin the fruits to one fruit per cluster. The fruits will have to be spaced six inches apart to form good-sized fruits. When the cordon has reached the top wire, it is important to make sure that all new growth does not occur at the top of the tree only. To that effect, lower the complete cordon, initially to a 40-degree angle. In later years, it is possible to lower it to the final angle of 35 degrees. As the trees become older, thin out the fruit spurs and encourage new replacement wood to form in its place. Please note that the diagonal ochre posts are in fact 1.80 metre lengths of bamboo canes. The trees need to be tied to these canes, firstly because it is essential to maintain the 45 degree angle. This can later be lowered to 35 degrees, if growth is unevenly spread over the total length of the tree. The bamboo canes are also used because trees tied to wire are at risk, because the trees can very easily grow into the wire, which can cause severe damage to the trees, resulting in canker and branch breakages. In addition, it is important that the union of the trees is at least 4 cm above soil level.